The end-of-game, bottom of the 11th, heroics began with Johnny Field's one out double and Eury Perez's ground-out that moved Fields to 3B. Then, when asked to intentionally walk Jake Hager, Louisville's Kevin Shackelford simply came unraveled. He nearly threw away the ball a couple of times. After that, he walked pinch-hitter Hank Conger (Conger pinch-hitting? More later), bringing Taylor Motter to bat with the bases loaded. I thought Motter was going to wait Shackelford out and he did watch the first pitch for a ball. But the next one he connected for a sharp hit to left field that brought in the winning run. However, for baseball fans, the fascination with this game was the extreme oddity of 8 different players in the #2 spot in the batting order! That is very likely a first in Durham Bulls history. It all hinged on how the designated hitter rule works. The game began with Jaff Decker, Jake Goebbert, and Hank Conger on the bench. In the 3rd inning, in his second at-bat, Daniel Robertson, the starting third baseman, drew a walk. He got spiked by the first baseman during a fouled-up pick-off throw. He went to 2B, but had to leave the game. Jaff Decker came in as a pinch runner (#2 player in that spot). Manager Jared Sandberg decided to "burn the DH". That is, to use Richie Shaffer, who'd started as the DH, at third base. In turn, that meant that the pitcher was required to bat in the #2 spot or be replaced with a pinch hitter. So, pitcher Eddie Gamboa moved into #2 spot in the batting order. In the 5th inning Gamboa, for the first time in his professional career, came to bat. You have to wonder if he even had a batting helmet or a bat. To great wonder and excitement, he got an infield single, moved to second base on a wild pitch, and scored on a J.P. Arencibia double, executing a nice slide across home plate. In the 7th inning, relief pitcher Dana Eveland moved into the slot. Eveland has time with two National League clubs. In 13 years in baseball, he'd had quite a few plate appearances, but none since 2014. He drew a walk, but never got past first base. The fifth player in the #2 slot was pitcher Ryan Stanek. When he came to bat in the 9th, Jake Goebbert came in to pinch hit (player #6 in the slot). Goebbert flew out the left field and reliever Danny Farquhar (#7) moved into the slot. When he came to bat, the last position player on the bench was weak-hitting catcher Hank Conger (#8). He was sent in to pinch-hit. As mentioned above, he drew a walk and set up Motter for the win. Still with me? If not, that's OK. As regular readers know, we here at WDBB thrive on quirkiness. Keeps our interest up. The Bulls remain in first place in the South (yahoo!) and have moved a game and a half ahead of the Gwinnett Braves. The Bulls go for six-in-a -row tonight. Then, remember Richie Shaffer's still at bat, a double by him brought home Taylor Motter from second base and the Bulls went ahead 2-1. In the next inning, the game came unraveled (from the Bats point of view) or we could say that the Bulls bats came alive. In the middle of it? Eury Perez. Jake Goebbert drew a walk to start the inning, moved to third on a Johnny Field single. A Perez grounder towards second base started a double play effort, but Perez did get an RBI when Goebbert came home. Even better, the shortstop threw the ball away instead of finishing the double play and Perez ended up on second base. Jaff Decker picked up the Bulls' sixth walk of the game and Taylor Motter hit a very pretty home run over the Blue Monster. Bulls went ahead 7-2 on just 4 hits. The Bulls picked up a couple more runs in the 6th. Austin Pruitt got his 6th win. All was right in the world. If you're curious about all the "non-waiver trade deadline" talk. Here's the definition. Not saying it will help understand why folks are so obsessed with it. But maybe. In one of oddest of the many oddities of this season's schedule, the Louisville Bats are coming to town tonight. This is the first time in our memory that an out-of-division team has ever visited twice in a season. Not only that, although the Bulls will play the Bats eight times this year, six games will have been in Durham and only two in Louisville. The Bulls did not do well in the previous games, losing 4 of the 5. 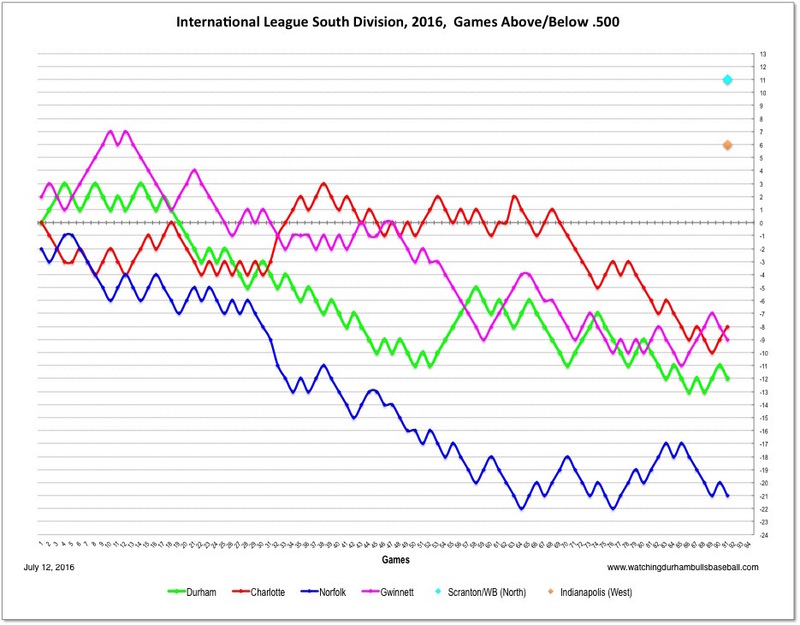 The Louisville Bats, Triple-A team of the Cincinnati Reds, is in third place in the International League West. 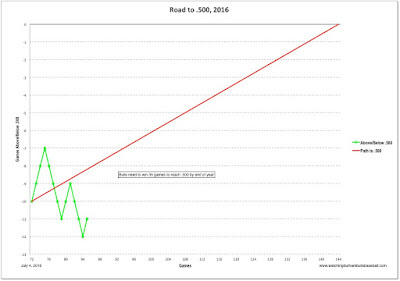 By the stats geeks Pythagorean Expectation formula, they "should" be doing much, much worse than they are. By PE their won-loss record should be 45-60, which would push them down into last place in the IL West, behind the Toledo Mud Hens, the team the Bulls just swept. The Bulls offensive stats ticked up every so slightly this week. Here's hoping that continues. The Raleigh News & Observer has not entirely abandoned Bulls coverage this year, although the game stories are just a cut-and-paste from the Bulls "wrap" items. The paper has been doing occasional feature articles. Today they had one on Eddie Gamboa and his knuckleball. Pretty good. Have to wonder, though, why the photo is of Gamboa in a Mexican winter league team uniform not throwing a knuckleball. More on Patrick Kinas' trip to the Summer Olympics here, with video. Sounds like a lot of work (and a lot of fun). This sweep of the Mud Hens is a big deal. 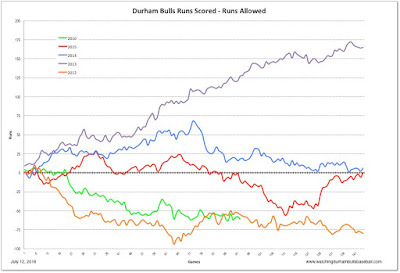 Not that the Hens are all that good a team, but Bulls pitching and hitting showed some real improvement. In fact, the offensive trends are up since the All-Star break. As an example, sacrifice flies are a rarity this year. The Bulls have only had 25 in the season and only in two games have they had two. Both of those games were in July. Both of them wins. Last night Richie Shaffer and Jake Goebbert both had sac flies in the 4-run 6th inning that won the game. Patrick Kinas, the Bulls' superb broadcaster, is off to Rio to broadcast Olympic swimming. He will miss 22 Bulls games. In his absence we will be hearing quite an array of "voice talent". Check out the list at the link. If I heard right, there's a very good reason that Casey Coleman suddenly went on the disabled list — he had an emergency appendectomy a couple of days ago up in Pennsylvania. Why the Bulls, or, for that matter, reporters that cover the Bulls, don't pick up on human interest stories like this continues to surprise me. About the only way to get details about the Bulls is to listen to Kinas' pre-game interviews with manager Jared Sandberg, which the Bulls don't podcast. At any rate, we wish Coleman well. No idea how long his recovery will take. Trade rumors are a'buzzin' [Rays Index]. Why should we care? Because the Rays could be trading for prospect talent and that talent could end up here, not to mention folks that might get called up to replace traded players. The Bulls have a day off. The Louisville Bats come to town on Friday, 7 pm. The Bulls remain in second place in the IL South. The Charlotte Knights have had an awful stretch. The Gwinnett Braves have bounced back from a big collapse. The longest game of the year ended in a very satisfying victory with a clear-cut hero in Jaff Decker. First, his 3-run homer in the bottom of the 9th tied the game. Then he bunted for a single in the 14th. Got moved to second base on a Hank Conger sacrifice. Then scored for the walk-off win on a beautiful Daniel Robertson hit down the right field line. Robertson got the ice dump, as he should have. Before that 9th inning home run, we were regretting the decision for Justin Marks to come out for the 7th inning. Up to that point, the Bulls were ahead 1-0. We did note, however, that the Mud Hens were hitting a lot of deep fly balls, 8 so far in the game. After a walk, a deep fly ball got over the wall and that put the Mud Hens ahead. It wasn't until then that the Bulls even had a reliever warming up. Rhyne Stanek had his worst appearance of the year. Two runs were added. The rain started falling. I went home and turned on the TV in time to see Decker's heroics. I'm liking young Casey Gillaspie more and more. It seems odd to me to find a player who plays only first base, but he does a good job of it and he gets on base, a lot. Given the differences in their appearances and games played, you have to think it's very odd that he and Jaff Decker lead in a lot of statistical categories. They are 1 and 2 for both on-base percentage and OPS. Decker's been in 72 games, Gillaspie in just 10. Gillaspie had a double and a walk last night. Richie Shaffer, by the way, had three walks in his 6 plate appearances. Ryan Garton came off the DL to pitch in last night's game. Casey Coleman went on the DL. Melvin (the shortstop formerly known as BJ) Upton is now with the Toronto Blue Jays and back in the American League East. Fondly remembered as "E6" for those of us who sat on the first base side of the field during the three years (2004-2006) he spent time with the Bulls. During those years he committed 111 errors, earning his nickname. On the other hand, he was also just about the most gifted pure athlete to wear a Bulls uniform for an extended period of time. We mentioned all the trade talk. Here's an example from Rays Index. There's lots more. In yesterday's post, I complained about new guy Hank Conger who was not having a particularly good introduction to the Bulls, hitting just .130. Nor could I understand why he'd be put in a DH slot with that kind of record. And then there he was in the lineup as DH as I filled out my score card! I grumbled about that all through the first two innings, along with being appalled at the appearance of the turf. The outfield looks just awful. I continued to be sure of my opinion even after Mr. Conger's single in the 3rd inning. After all, every one of the players on the bench, Jaff Decker, Richie Shaffer, or Daniel Robertson, had much better stats than him. But then he came to bat in the 4th. By that time the Bulls had scored a run off an Arencibia fielder's choice. Runners were on first and second with two outs. So what did he do? Batting left-handed (he's a switch-hitter), he chips one over the Blue Monster, bringing home 3 runs and putting the Bulls ahead, 4 to 2. Jake Goebbert hit a home run the next at bat to put the game away. Bottom line: As much as it pains me to my soul to admit it, putting Hank Conger in the lineup in the DH slot was the right call last night. Jacob Faria had a good night. It was particularly notable following his last two starts where he had Game Scores of -6(!) and 24. But it was a hitters' game. J.P. Arencibia continued his hot streak with a single and 2 RBIs. Taylor Motter hit two doubles, scored 2 runs, and had an RBI. Dayron Varona had a double, walk, scored a run, and an RBI. We've already mentioned the homers by Conger and Goebbert. Plus, we need to mention that twice the Mud Hens put a runner on third base with a triple and neither of them scored. Good defense, good pitching. 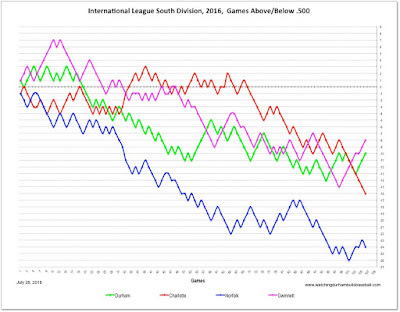 The Bulls are 12 games below .500, but have moved into sole possession of second place in the South Division of the International League. (standings). The web is abuzz with possible deals involving the Rays. Most of the speculation involves them trading off starting pitchers. If they are dealing pitchers for prospects, we can expect some roster turmoil here with the Bulls. After starting the post-All-Star trip with two losses in Syracuse, the Bulls then pulled off four wins in a row, wins that started with a spectacular no-hitter by Justin Marks and continued with decent hitting. The wins included two in extra innings. Two Durham Bulls, Marks and J.P. Arencibia, were named as IL Players of the Week. Then we have these three one-run losses where three usually reliable starters aren't so reliable. 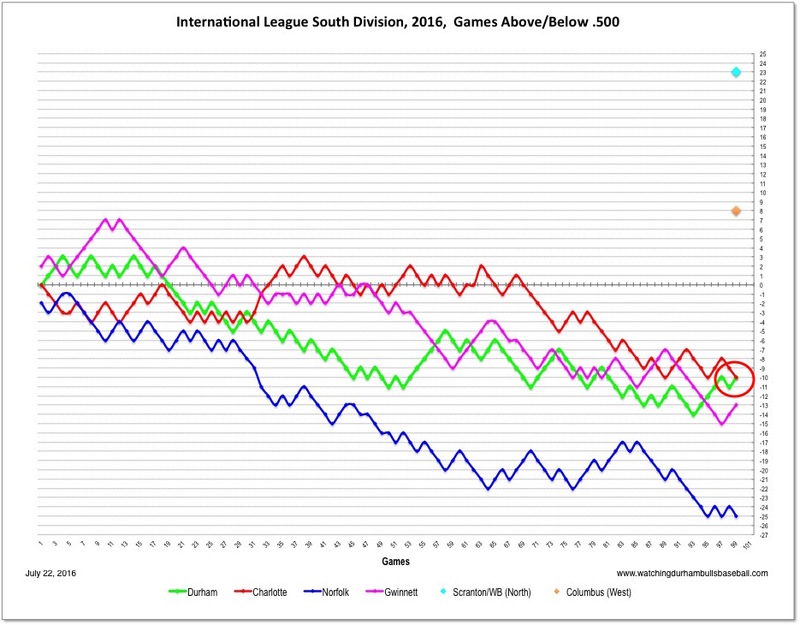 Oddly enough, for a day or so the Bulls were in first place in the IL South, tied with the Charlotte Knights. Today the Bulls are still tied with the Charlotte Knights but they are both in second place. The Gwinnett Braves have ridden a five-game winning streak into first place. This has to have been the toughest road trip of the year for the Bulls and we can guess that they are looking forward to being back in Durham and Thursday's day off. I have to mention my annoyance with one of the Bulls newest members, Hank Conger, a catcher who appears to bring nothing to the team (unless he is particularly good at handling pitchers). In his 6 games as a Bull he's had just 3 hits (.230/.167/.217), although he is fitting right in with his 8 strikeouts. Why would he DH with those kinds of stats? By the way, the Bulls lead the International League in K's with 887. If we aggregate the stats over the 11 games, we see a few ticks upward in hitting stats, a small improvement in the relief crew's work, and a worrisome drop in starting pitcher performance. 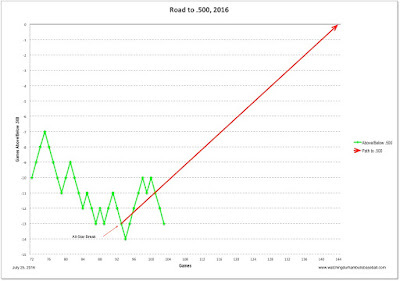 Lastly, continuing our look at a Bulls' "Road to .500" possibilities — steep road. 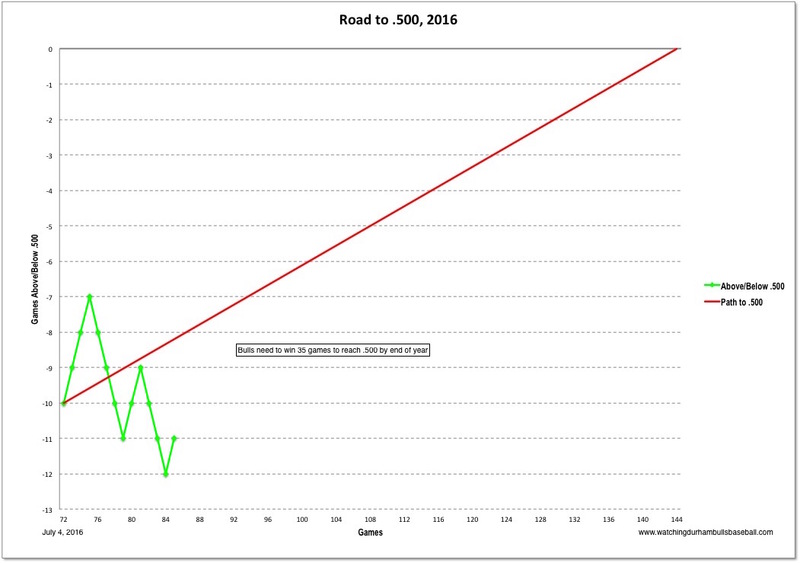 The Bulls need to win 27 out of their next 41 games to get to .500 on the season. 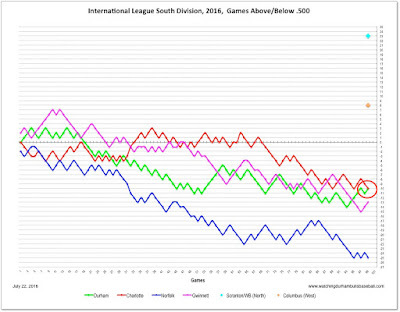 The Bulls are in 1st place in the International League South Division! How weird is that? They are 10 games below .500 and yet they are tied with Charlotte for first place. Plus, they won a game from the best in the IL in a very impressive fashion. See the chart below. At first, it looked as if Justin Marks, who threw a no-hitter his last time out, was going to have a very short outing. He got through the first inning OK, but the 2nd was a disaster. Then, the Bulls had a great top-of-the-3rd with Taylor Motter's 2-run homer a highlight and acting manager Ozzie Timmons left him in the game. A couple of double plays helped as he did a good job through the 5th. Timmons and, very likely, pitching coach Kyle Snyder, had to make the decision because manager Jared Sandberg had gotten himself thrown out of the game in the 1st inning. By my count, this was the fourth ejection of the year (2 wins and 2 losses) and gets us wondering about his anger management skills. Did he have a legitimate beef? Probably. Nick Franklin had taken a pitch off his hand that was called a foul ball, not a hit-by-pitch. Franklin ended up leaving the game. In the 4th Richie Shaffer hit a long home run to tie the game. Jaff Decker drew a walk and did some nice base running to get to 3B on a Daniel Robertson single. Decker came home on a Johnny Field sac fly. That put the Bulls ahead to stay. Speaking of Decker, in the 8th the accounts will show he hit a double, and that's fair. What they don't say is that the hit was a dribbler that barely made it past the infield and the RailRiders didn't expect Decker to even think about going to second base until they looked around and there he was standing on the bag. Decker came home for the Bulls' 8th run on a Johnny Field single. Add in Daniel Robertson's 2-run homer in the 6th and you have the Bulls best day at bat in a long while. Kirby Yates, one of WDBB's all-time favorites (e.g., see a typical post here), came to the mound to pitch the 9th inning for the RailRiders. After coming up through the Rays system Yates started the season as a Yankee. He came down to the RailRiders at the end of June. Overall, he seems to be doing OK on the year even if he's back in Triple-A. J.P. Arencibia, who must have caught him a couple of times last year, seemed particularly amused during his at-bat, and he managed a single off of him. Morning did not suit the Bulls yesterday, especially young Jacob Faria. He will undoubtedly improve, but he's obviously having trouble adjusting to Triple-A hitters. Nick Franklin is back with the Bulls and accounted for all of the game's RBIs. Dayron Varona continued his hot hitting. Richie Shaffer committed his 14th error. Hank Conger is still working toward his first hit as a Bull. Eury Perez was moved to the Sand Crabs to make room for Franklin. If this looks/sounds familiar, it is. I mistakenly put it up a couple of days ago when I misread the schedule. Updated. Since then the RailRiders have gotten even better and the Bulls have remained in the cellar for offensive stats and middle of the road in pitching. 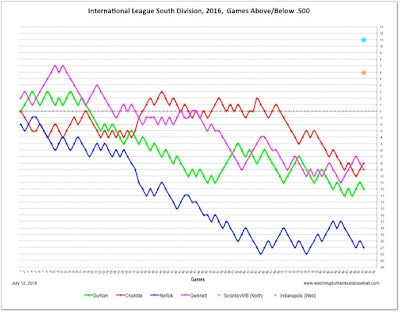 As can be seen, the RailRiders lead not just the North Division, but the entire International League in all these key metrics. They are 4th in errors committed, but the Bulls are 14th in that category, too. The RailRiders are coming home from a 3-game series in Charlotte where they lost 2 of 3. However, they've won 7 of their last 10. Gonna be a tough series. Eddie Gamboa had his second terrific start in a row, thoroughly baffling the Red Wings lineup. Plus the offense put together 6 runs on mostly small ball. In the dugout after six innings, he should have been chalking up his sixth win. Dana Eveland had a nice, clean 7th inning. Then there was a truly awful beginning of the 8th. The Red Wings scored 5 runs off of Steve Geltz to tie it up. No fan just watching from the stands or on TV can do anything more than just speculate, but this is Mr. Geltz' second visit back from Tampa Bay and he's not doing well at all. On yesterday's 1/3 of an inning his ERA ballooned from 3.31 to 5.94. More than that, he just doesn't look confident on the mound. New guy Casey Coleman came on to get out of that inning and the 9th. In the 10th a walk and a single (Casey Gillaspie and Richie Shaffer) led to a pitching change. After Jaff Decker K'd, a bit of shakiness on the part of the pitcher/catcher combination led to a passed ball and set up Dayron Varona's second RBI. Then new guy Ryne Stanek simply blew away the Red Wings in the bottom of the 10th. The Red Wing announcers were called the fastball speeds and they were 97-98 mph most of the time and one was 100. A very impressive young man. Nick Franklin is coming back. In yet another example of how little I understand Rays' decision-making. Here's a guy who has played in 4 different positions for the Rays over 19 games and a holds a .836 OPS. And they are sending him back? Happy to have him. But looks foolish on the Rays part. Early morning game today. 11:05. The Rochester Red Wings have the best defense in the International League. 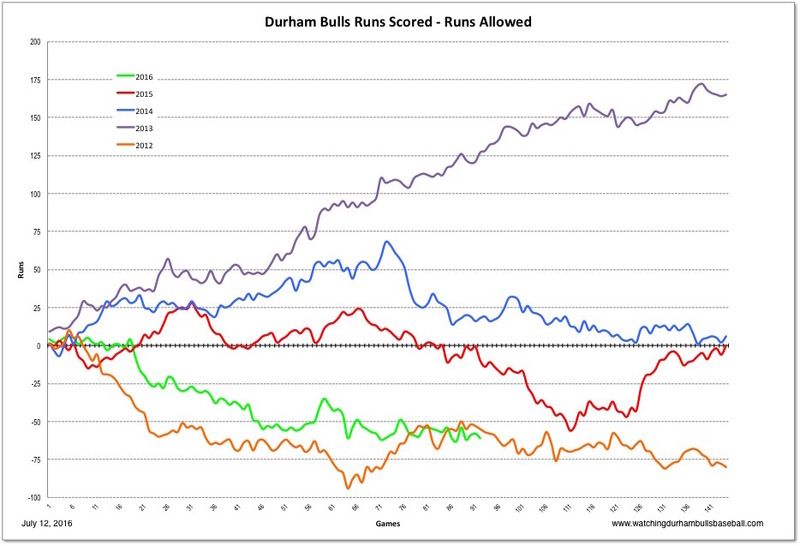 The Durham Bulls have the worst. Did not work that way last night. Two errors from the Red Wings led to 8 unearned runs by the Bulls. The big moment was Taylor Motter's grand slam in the 10th. Following as it did a throwing error, two walks, and a run-scoring, tie-breaking single, it was perhaps understandable that the Red Wings manager Mike Quade made some intemperate remarks directed at Motter. They were enough for him to get thrown out of the game. The grand slam was needed. 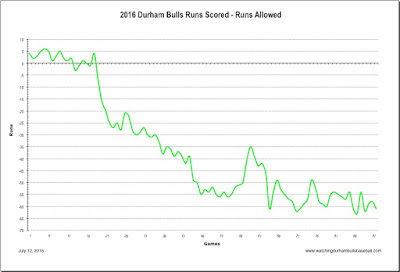 Bulls pitching gave up a lot of hits, 15 of them, including 3 home runs, one of them in the bottom of the 10th. A pitcher just back from Tampa Bay, Ryan Garton, was credited with both a blown save and a win after an ugly 9th inning. Durham Bulls players made a clean sweep of the Player of the Week honors in the International League. Justin Marks was named Pitcher of the Week and J.P. Arencibia was named Hitter of the Week. Congratulations! Speaking no-hitters, we trolled back into the vast WDBB archives and found this account of the last time Bulls pitchers threw a no-hitter. Then there's this story from the Rochester Democrat and Chronicle that digs into the possibility that the firing the Minnesota Twins General Manager could have an impact on who the Red Wings affiliation with the team. It turns out that the Red Wings, Lehigh Valley IronPigs, and Toledo Mud Hens have contracts that expire at the end of the season. Catcher J.P. Arencibia accounted for a big fraction of the runs yesterday, for both teams. His solo home run in the 2nd inning started things off. Then a 2-RBI double in the 4th put the Bulls ahead 3 to 1. A bases-loaded passed ball let in a run for the Chiefs in the bottom of the 6th. Another solo home run in the 8th put the Bulls up 6-2. Jamie Schultz is apparently on a very restricted pitch count, something like 75 pitches per game. He is up to 1,634 pitches on the year (19 starts), the most of any starter on the team. Perhaps because the Rays want him to be available in September? At any rate, he did OK yesterday. Several of the newish guys followed, all except Danny Farquhar looked fine as well. Farquhar's stint was affected by yet another iron-handed play that led to two unearned runs. I'm puzzled by the Chiefs' dismal attendance, just 3,000 for a Sunday afternoon. I've never been to Syracuse, so all I've seen of the park is what shows on the MiLB-TV shots. All day yesterday the background visual was trains, noisy trains. From the satellite shot (below) the location appears to be industrial, very different from so many other minor league parks that are located in the middle of cities. Maybe it's their affiliation, they are far from Washington, DC. On the TV broadcast during the Friday blowout the announcer made the comment that the IL South Division was, "an affront to organized baseball." And he regularly pointed out the Bulls' dismal stats, especially their strikeouts and batting average, both worst in the league. So it was satisfying to take these last two games. I do have to note that he was more than gracious when he called the final inning of Marks' no-hitter. The Bulls have seen 31 different players on the mound this season. Three were position players. Several have been called up. Some have come back. Others have been released. They have 13 on the roster, but that's a moving target. We charted 12 of the current crew and included Adam Wilk, who is currently on the disabled list. Not included are Ryan Stanek, Casey Coleman, Kyle Winkler, and Dana Eveland because they have very few innings and/or their roster status isn't clear. Also note that Jacob Faria, who is on the chart, only has 15 innings in Triple-A. Overall, as was noted in our previous post, the pitching crew is doing OK. 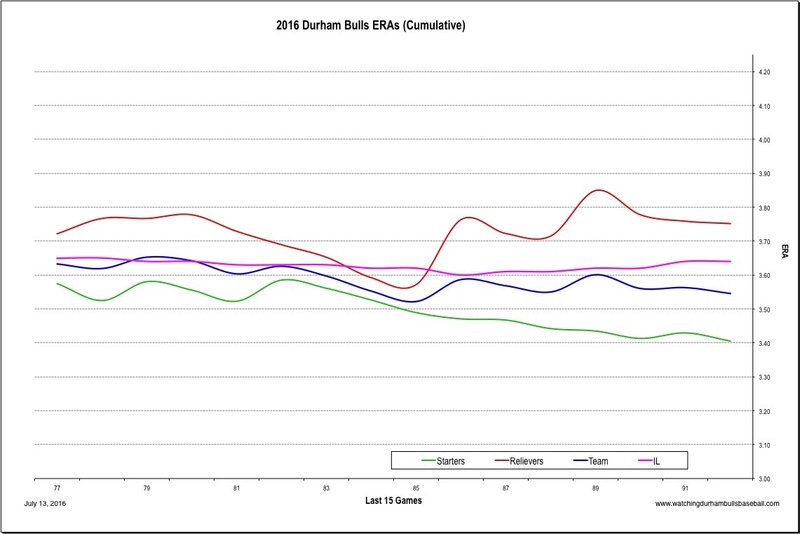 The stats geeks don't like ERA for lots of reasons. 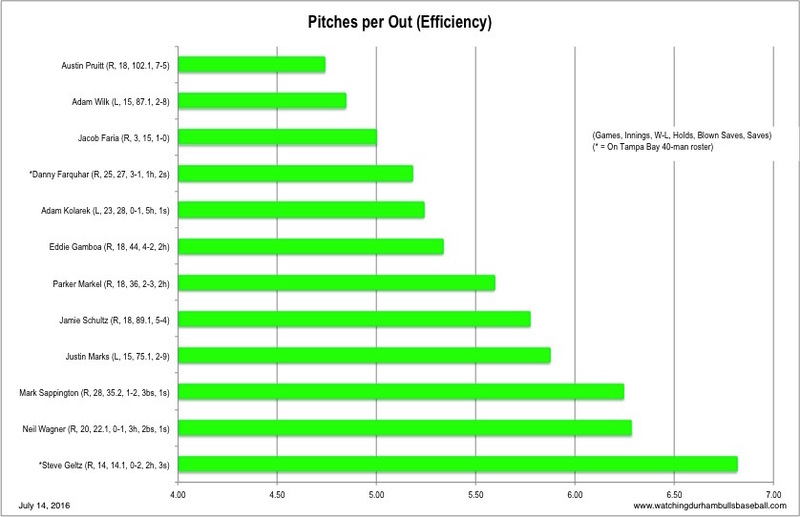 So here's a chart with both ERA and FIP (Fielding Independent Percentage). In general, FIP seems better for a short-term look and ERA for a longer term. This chart is sorted by FIP. We have a sample size problem (few innings) with a couple of the guys. Nevertheless, the bottom four pitchers, which include a starter and three relievers, are not having good years, the rest are OK.
Walks/Hits per Inning Pitched, interestingly, sorts out with the same four pitchers on the bottom. 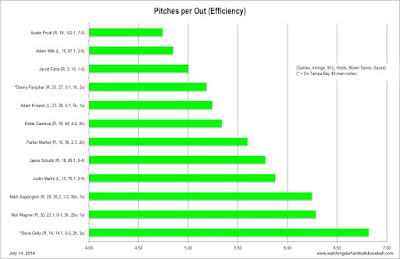 This is a home-brewed stat that basically highlights just how hard a pitcher has to work to get an out. Again, the same four pitchers— Steve Geltz, Neil Wagner, Mark Sappington, and Justin Marks—are at the bottom. 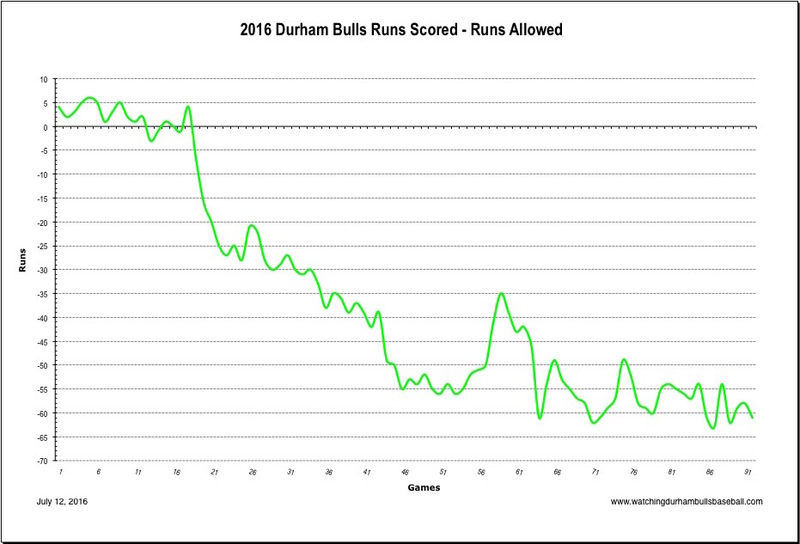 Coming to the plate so far this year we've seen 21 different Durham Bulls. We've charted 14 of them, but admit that it could be a moving target. A catcher, Hank Conger, is on his way from Tampa Bay. Kyle Roller, who was in 50 games this year, has been released. Cameron Seitzer and Mayo Acosta are on and off the roster. Juniel Querecuto is with Montgomery at the moment. This is not a very impressive crew this year. We pointed out the team stats in a previous post. 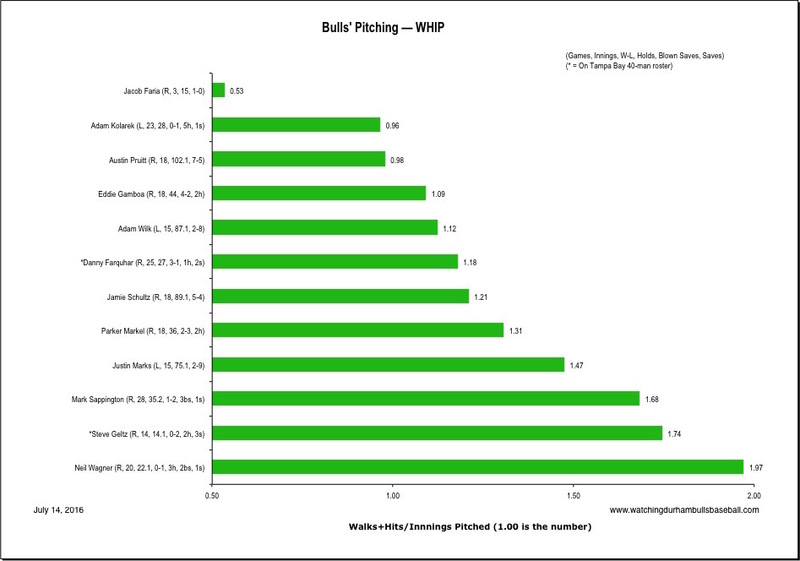 The individual stats show only 4 with positive wRAAs and one of those, Johnny Field is on the disabled list. It's worth noting that all but two have now gotten above the "Mendoza Line" (.200) in their batting averages. However, when watching a game it's hard to get your hopes up when any of these guys come to the plate. From a fan's perspective, we have to say that the players who have been the most fun to watch were Jaff Decker, Dayon Varona, and Taylor Motter. We have hopes that Jake Goebbert and J.P. Arencibia will catch some breaks. We think Luke Maile is breaking out, but he or J.P. Arencibia is likely to be called up today or tomorrow. Richie Shaffer is helping the team a lot, the best wRAA of them all. It just seems like he is working so hard, for less return than hoped for. 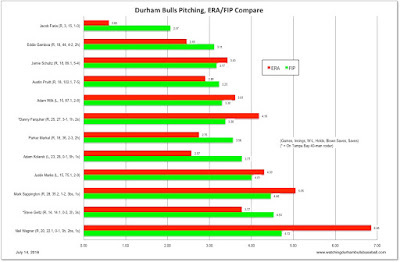 Bulls pitching has been just fine. The starters' collective ERA is 3.40, much better than the league average of 3.64. The relievers have not been doing nearly as well, but as a team, the pitching crew has been better than the league average. 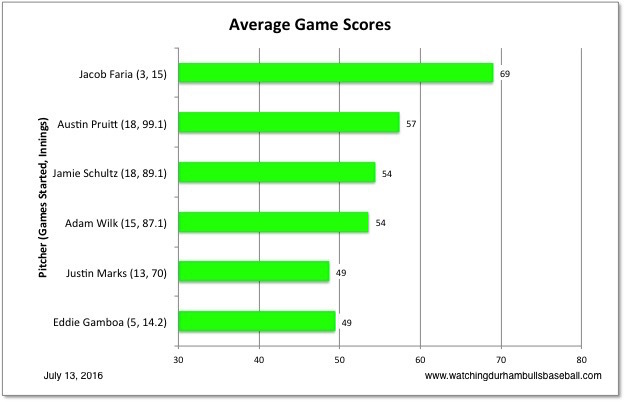 The Game Scores chart reflects the starting crew's strengths and weaknesses. Adam Wilk is now on the disabled list and Eddie Gamboa had quite a stretch on the list as well. Clearly, Austin Pruitt is the better of the crew that started the season and Jacob Faria's three games have been very promising. Note that a Game Score of 50 is considered average. The fundamental problem with the 2016 Bulls is hitting. 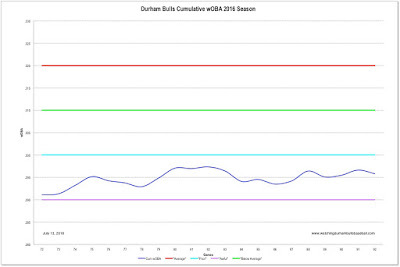 The team wOBA (Weighted On-Base Average) at the moment is .296. 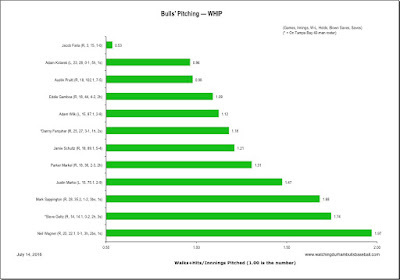 In general, .300 is considered "poor" and .290 is considered an "awful" wOBA. 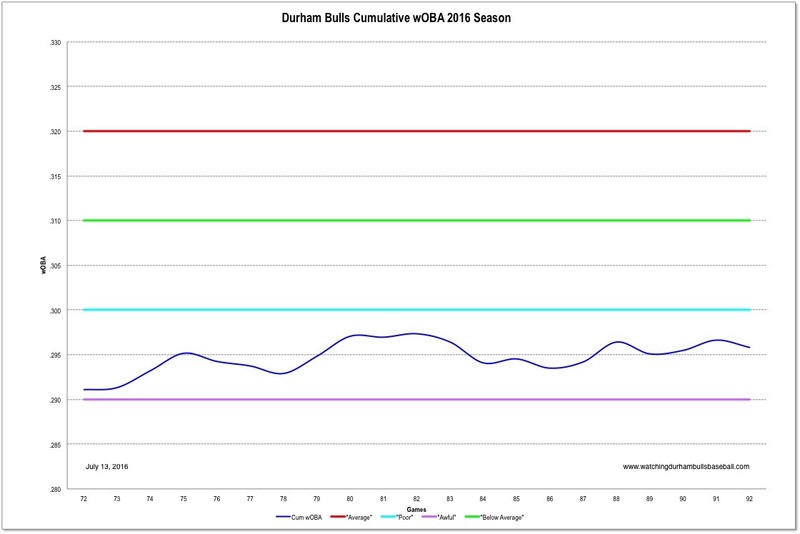 For the last month or so the wOBA has wavered between "awful" and "poor" with no real trend one way or another. See Part 1 for charts on overall team performance. This leads quite naturally to the speculation that if the Bulls could make a serious run at reaching just the .500 mark they'd have a chance at winning the division and making the playoffs (the wild card is obviously going to come from either the North or West Division). 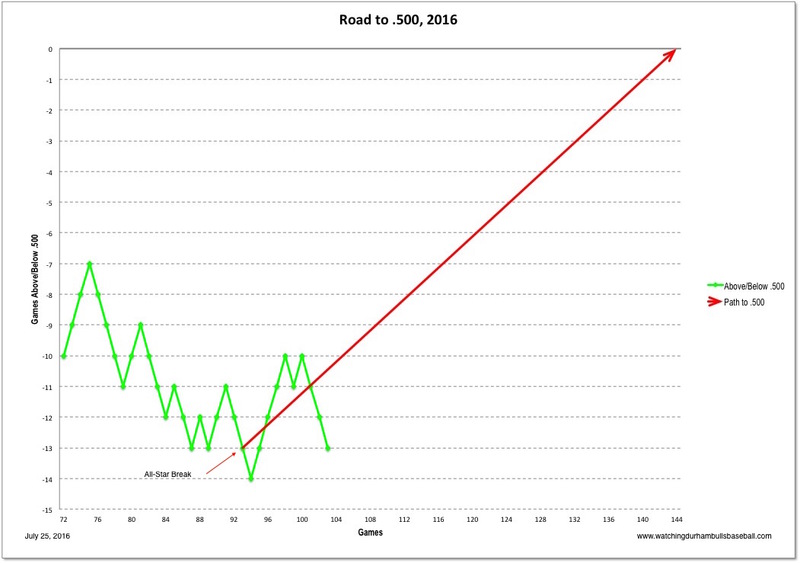 So here's a chart that tracks the Bulls' performance back to mid-season (72 games) and shows the path to .500. The Bulls need to win 32 out of the next 52 games to get there. How did the Bulls descend to such levels? Well, their opponents scored more runs than they did. How's that for a blinding glimpse of the obvious? 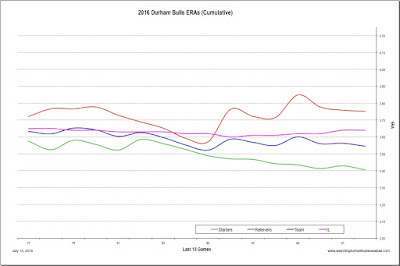 The Bulls' run differential seems to have stabilized over the last several games. Unfortunately, that stability has come at around the -60 mark. It could be worse. 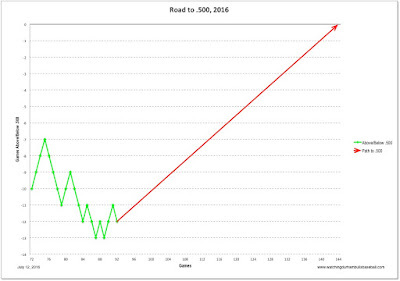 If you take the run differential and process it through the Pythagorean Expectation formula the Bulls "should" be at 38-54 instead of their actual 40-52. Small favors. How does the current situation compare to previous years? Well, the Bulls are reaching down into 2012 territory, but that was between two Governors' Cup years. 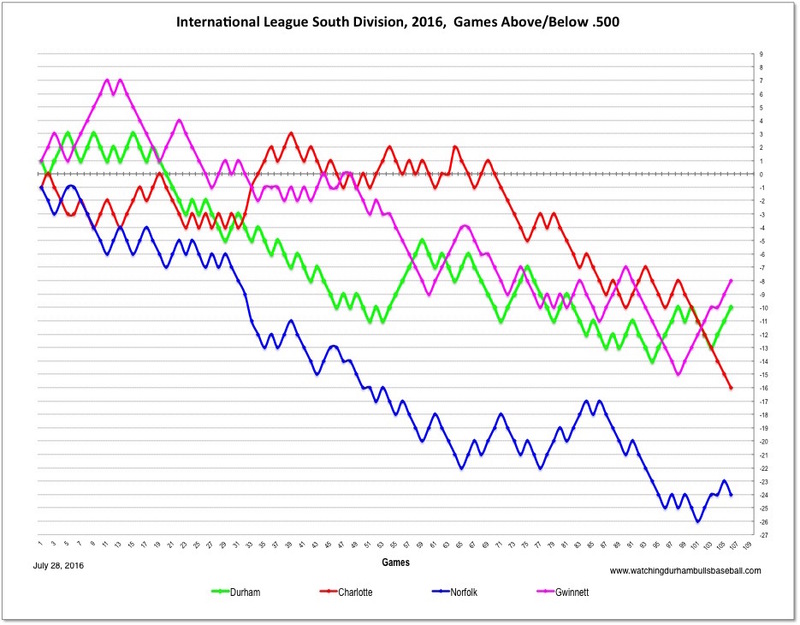 In 2012 the Bulls finished 66-78 and in third place in the South Division. The big deal, for me, in the 6 inning continuation of Friday's game, was to see Eddie Gamboa stretch out. This was the first time he'd reached 5 innings and he kept his pitch count (62) in a reasonable range. His best this year, a year I'd been hoping he'd break out as a knuckleballer. The other moment was Richie Shaffer's home run in 8th. Pretty shot. In the 7-inning second game we saw something very unusual for this year's Bulls, sacrifice flies (by Dayron Varona and Daniel Robertson). The Bulls have only hit 19 of them this year and this was the first time with more than one in a game. We're worried about Jamie Schultz. He seemed to be working really, really hard. It took him 65 pitches to get through 3 innings and he gave up a bunch of walks. When he left we got to see both of the new guys, Kyle Winkler and Casey Coleman. Winkler had a tough 4th inning that started out with Richie Shaffer's error in right field, but ended up with a bases-loaded flyout to left. Not particularly impressive. On the other hand, Casey Coleman looked very good allowing just one hit and striking out 4 in his second appearance as a Bull. Adam Kolarek was just a bit too exciting, thank you very much. He got two quick outs, then walked two batters before getting the last out. Has Richie Shafer turned a corner? Maybe. He had a good night with a homer in the first game and two more hits in the second game. I think, but am not sure, that it was the first time this year that every batter in the lineup (second game) was batting over .200. Taylor Motter broke through the Mendoza line by the time the game was out. Sad to say, but that's a big deal with the 2016 Durham Bulls. Juniel Querecuto was sent down to Montgomery to make room for Kyle Winkler. Kyle Winkler was added and we saw him pitch. We saw him last year when he came up from the Biscuits at the end of the season, but it looks like he started this year in independent ball and did not join the Biscuits until after the season started. Good numbers with the Biscuits. Stats. The Tampa Bay Rays descended into unchartered territory, 19 games below .500. Reflections by Tampa Bay Times reporter Marc Topkin here. The tarp was pulled when Jaff Decker was at bat in the bottom of the 1st. Then they took it off. Then they put it back on. After hanging out for 45 minutes or so, I gave up and went home. Two hours after the first pull the game restarted. By that time I was dried off and ensconced in front of my TV. For the Bulls, Jaff Decker at DH drew a walk and then got caught trying to steal second base. After that, the Bulls were no-hit until the bottom of the 8th while the Pawsox feasted off five Bulls pitchers (including Decker who pitched the 9th). Parker Markel just never got into any kind of groove seeming to alternate between K's and BB's. In the end, he took the loss. He gave up just 4 of the 16 hits the Pawsox put together. We did get to see a new Durham Bull, right-hand reliever Casey Coleman. But broadcasters Kinas and Pose were too busy nattering on about video games from their childhood to tell us about him. Coleman does look to be an interesting guy. See links here and here. He opted out of his contract with the Mariners. He was having a decent season with Tacoma in the PCL. Obviously, he did not do all that well last night, 3 runs on 4 hits and a hit batsman. Have to say I could care less about video arcades in the midwest in the 70's (80's?). I do care about learning at least a little bit about a new Durham Bull that the Rays signed a day ago, and why they signed him. Note: Perhaps Coleman was introduced in the pre-game show. Not sure. I'm having difficulty getting my little radio to work inside the ballpark. Final admission: I gave up with the Bulls behind 7-0, thoroughly annoyed with the broadcast crew and with the Bulls. I don't know any more about the last couple of innings than you do if you read the wrap or the Herald-Sun story. The Bulls are offering a ticket exchange for anyone who had a ticket last night. But — a big but — you have to go down to the ticket office to get the exchange. Good luck with that. Details at the wrap link. The Gwinnett Braves have moved into first place in the South Division (standings) even though they are 8 games below .500. Everyone else, including the Bulls, are even worse. With the new guy on board, Mayo Acosta has been assigned to Hudson Valley. These are big hitting numbers to go along with a solid game, and first Triple-A win, by new guy Jacob Faria. The guy I want to call attention to today is Luke Maile. Last night he had 2 doubles raising his total to 12 on the season and collected his 12th RBI. That doesn't sound all that special until we recognize he had a stretch of time early in the season on the disabled list and a not-very-successful early June. But in the last month, he's been hitting at a .309/.373/.471 pace, with 5 of his 12 doubles and 2 home runs (the only ones this year). He's started at catcher in 43 games this season, the rest of his games are as the designated hitter. Maile got a late call-up last year with the Rays and did OK behind the plate, not so good at bat. But lately, he's looking better, much better. He's on the 40-man and the Rays have catcher issues. Meanwhile, recent returnees Jaff Decker and Taylor Motter picked up 4 RBIs between them and every Bull except Mayo Acosta got a hit (and Acosta got a sac fly RBI). Manager Jared Sandberg recently gave a talk to a Durham sports club. Some insights into his managing philosophy presented. Dylan Floro got his first call-up to the major leagues. Likely to make his debut today. Good luck! Congrats! To make room, Dana Eveland, who has three appearances with the Bulls this year, was DFA'd. The Norfolk Tides may have the worst won-lost record in the International League, but they are a better team than the Bulls. Too bad that with this extremely bizarre schedule for 2016 the Bulls play them so many times. Two painful losses. So let's talk about something else. Taylor Motter, who's been up with the Rays for a while, got into last night's game against Detroit — as a pitcher. Jaff Decker cleared waivers and will be coming back to Bulls. The Montgomery Biscuits get a lengthy article in the most recent issue of The Bitter Southerner. Interesting that, unless I missed something, not once in the entire article are the Tampa Bay Rays mentioned, nor is there any commentary whatsoever on baseball actually being played. Not sure how the author managed that. Up in Washington, DC a bill has been introduced entitled, "The Saving America's Pastime Act." Turns out that, in some opinions, the whole purpose of the act is to keep minor league ballplayers in poverty. Two women have signed professional baseball contracts. Co-ed baseball has arrived. In a very big deal, a major league ballpark has arisen at Ft Bragg and the Braves and Marlins are scheduled to play tomorrow. A couple of links here and here.